The author enjoying the views overlooking Lake Tahoe from the Mt. Rose area. The more people who can enjoy the beauty of nature and the serenity it brings, the better. As much I enjoy the solitude in the woods, it makes me happy to see more people experiencing it for themselves, because with a greater appreciation for this natural world that we are a part of, the more connection we have and the more we realize that our actions have a direct effect on the environment. Donner Memorial State Park is located at the east end of Donner Lake, in Truckee, CA. Campsites can be reserved online, and are $35/night, with bear boxes at each site for food, and centrally located restrooms and showers at various locations in the park. In my opinion, the best sites are the ones near the south side of the park, as part of the Splitrock Loop (sites 108 – 152), because you are closer to hiking trails and Donner Lake, and further away from Highway 80. If you stay here, I recommend swimming in Donner Lake, hiking around on the many trails originating from the park, or even going to the Donner Memorial State Park Visitor Center to learn about the region’s history. 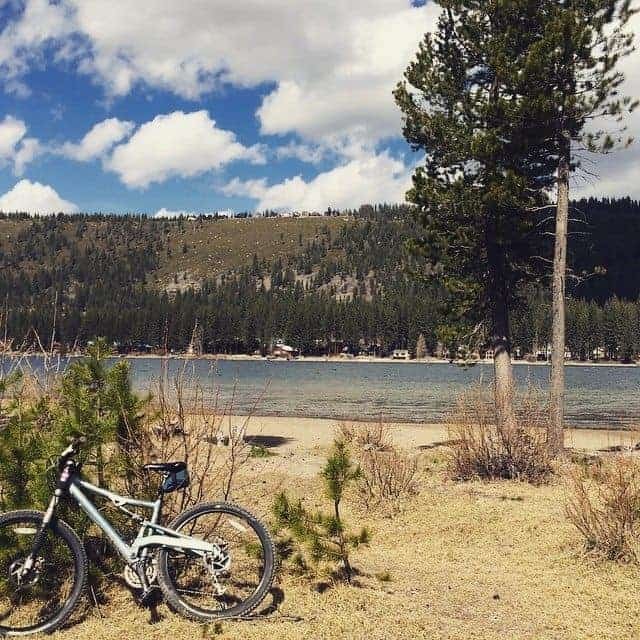 Biking and hiking trails abound right at Donner Lake, just outside of Truckee. Lake Forest Campground is located on the north shore of Lake Tahoe, near downtown Tahoe City, CA. Campsites are available on a first come, first served basis, and are only $20/night, so this is a great location to go either mid-week or during the shoulder seasons (Spring and Fall), but make sure that the campground is actually open before you go – it closes for the winter October 15. Although there are no showers at this campground, the invigorating water of Lake Tahoe is steps away! If you stay here, there are a number of restaurants and shops in downtown Tahoe City within walking distance. There are also two grocery stores in Tahoe City, allowing for easy access to food. If you stay here, I recommend renting a bike from Olympic Bike Shop and riding along the bike path from Tahoe City down the west shore of Lake Tahoe, for a picnic and swim! Meeks Bay Campground is located along the west shore of Lake Tahoe next to one of the most gorgeous stretches of beachfront at the lake. 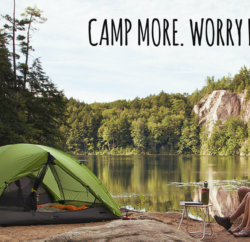 Campsites can be reserved online or in person, and range from $28 – $30/night. Campsites have bear boxes for food storage, and there are centrally located restrooms throughout the facility. I recommend the sites furthest to the east (and away from Highway 89), to get closest to the Lake and away from traffic noise. If you stay here, I recommend swimming in Lake Tahoe (the Meeks Bay shelf makes this part of the lake a little warmer than other locations) or hiking from the Meeks Bay Trailhead into Desolation Wilderness (Lake Genevieve is a great spot for a swim and a picnic). Mt. Rose Campground is located near the summit of Mt. Rose, just southwest of Reno, NV and northeast of Lake Tahoe, at an elevation of 9,300 feet. Campsites can be reserved online and are $20/night. Restrooms, potable water, picnic tables and fire rings are provided. 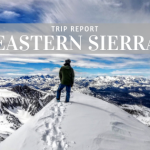 If you stay here, there are multiple hiking trails in the area, with some stunning views towards the east of Reno and Washoe Valley, and towards the southwest of Lake Tahoe. 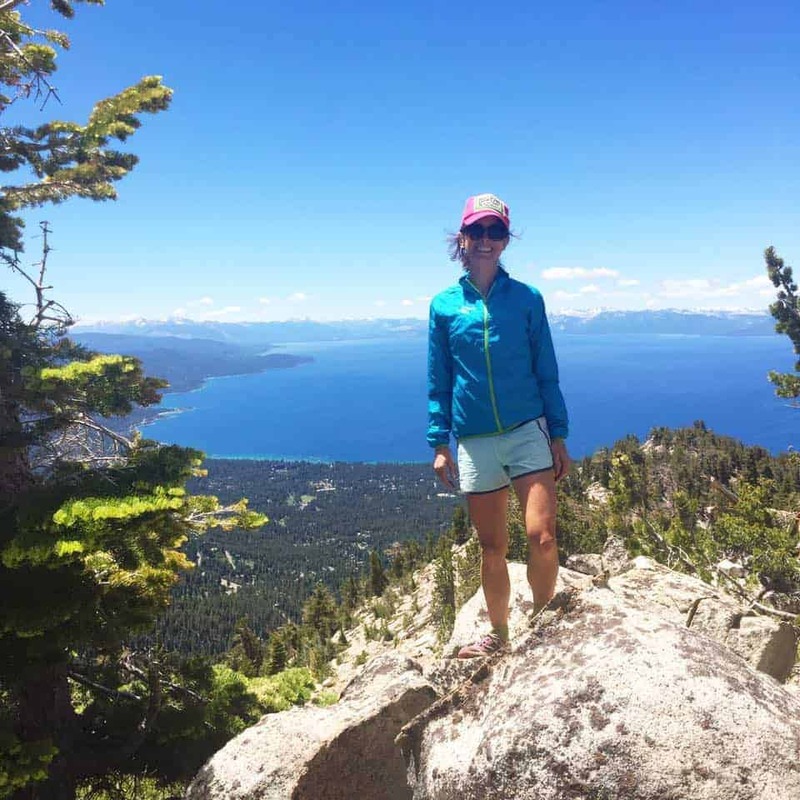 If you’re feeling athletic, check out the Mount Rose Summit Trail, to enjoy the views from the top! No matter how experienced or inexperienced of a camper you are, this question always arises. 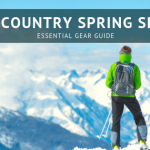 Gear can get expensive, and if you’re new to camping and aren’t sure if this is your thing, then making an investment in the fanciest items won’t make sense for everyone. 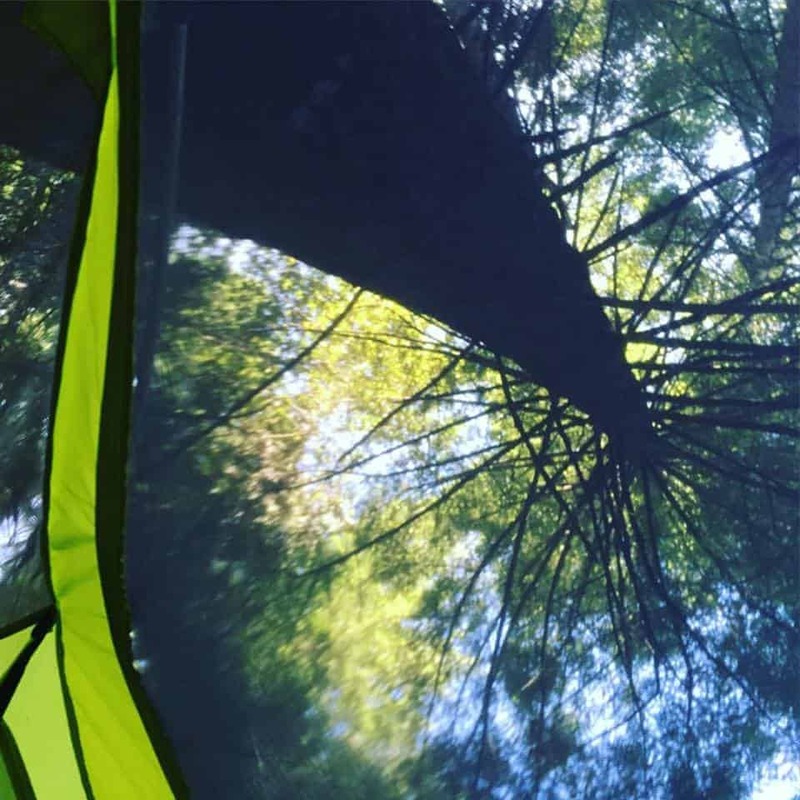 (Of course, my hope is that you’ll fall in LOVE with camping and the outdoor life and make it your mission to camp and get outside as much as possible!) Here’s a list of the basics, with my take on what’s important or not. Looking up into the trees from the mesh ceiling of your cozy tent. Pillow – The beauty of car camping is that you can just bring a pillow from home. If you’re backpacking, rolling your jacket into a pillow works too. Or this inflatable pillow from Sea to Summit is super awesome – small, lightweight, comfortable, and isn’t noisy due to the fabric covering. Miscellaneous – Towel for swimming/showers. Book for reading. Journal, camera, paints and paper for capturing the beauty around you. Binoculars. Hammock – enjoy an afternoon nap. Bug spray. Sunscreen. Playing cards. Day pack if you plan to hike – make sure it has room for your water, sunscreen, extra layer, and snacks. 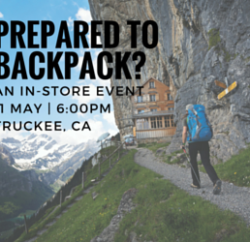 If you don’t want to purchase a bunch of camping stuff at this time, Tahoe Mountain Sports has a number of items that they rent out, including tents, sleeping bags, and sleeping pads. 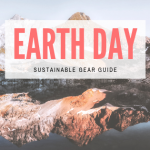 This is a great way to minimize costs without investing in gear that you may or may not want to use again (although I hope you enjoy your experience and want to camp more and more), and to learn more about what kind of gear works best for you and your family. If you do make a campfire, make sure to put it out. Dump water on it. Then dirt. Then stir it up. Then add more water. Then add more dirt. Check, double check, and triple check your fire site to make sure that the fire is 100% out. Feel the ground for heat. Then add more water. Pick up your garbage. And any other garbage you see. Respect the pristine outdoors and add your energy to keeping it that way. Leave no trace and encourage others to do the same. Turn off your phone. Unplug. Close your eyes and breathe in the clean air. Listen to the sounds around you. Smell the foliage. Reconnect – with yourself, with your loved ones, with the nature around you. Enjoy the mundane and see the grace and beauty in nature, which we are all a part of.